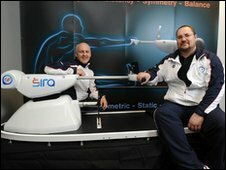 A pair of Welsh inventors who have developed a sports rehabilitation machine have been named the world's best inventors of 2010. It is the first time in the 15-year history of the award that is been won by a UK inventor. 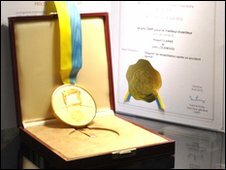 Robert Clarke and John Lockwood from Gorseinon, Swansea, were named the winners by the World Intellectual Property Organisation. It followed the first public viewing of their machine in Switzerland. Not only did the machine, which they call the Sports Injury Rehabilitation Assistant - or Sira, win the gold medal, it was also named as the winner of the medical inventions category at this year's International Exhibition of Inventions in Geneva. "The response has been incredible," enthused the man responsible for coming up with the machine designs, inventor John Lockwood. "This was the first time it had been shown in public, and we were still working on it until the day it was due to be picked up by the courier to be shipped to Switzerland. The device is used to deliver a series of stretching exercises developed by co-inventor and fitness coach Robert Clarke. The exercises are aimed at helping sportsmen and women recover from injury, and can also be used in medical physiotherapy situations. "Robert has been a fitness trainer for over 30 years, and had developed a stretching system for sports people," explained Mr Lockwood. "He knew I had been involved in inventions in the past, and asked if I could come up with a machine that could replicate what he was doing. "Now we have the very first machine of its kind in the world." But the inventors faced their own trial just to get to the Geneva exhibition last week, as UK airspace was closed down due to the volcanic ash cloud from Iceland. "We we due to fly out, but just in case I booked a ferry as well. So we ended up driving to Geneva - it was a long drive - but worth it," said Lockwood. "It was received fantastically - we had queues of people wanting to try out the machine." However, co-inventor Robert missed out on the gold medal ceremony, as he flew back to Britain at the end of last week to take part in the London marathon. "Robert managed to shave a minute of his personal best in the run - perhaps it was all the demonstrations on the Sira machine during the week that helped," suggested his business partner. Their company Sportfit Limited said it already hoped to have secured eight new sales for the machines, which cost about £6,000 each. The pair of inventors have also persuaded the Welsh regional rubgy side, the Ospreys to field test one of the Sira units, along with premiership football side Wigan.